On February 23rd, 1999, Shueisha published its official Digimon World guide, the pages of which contained the only known method of raising Metal Etemon. 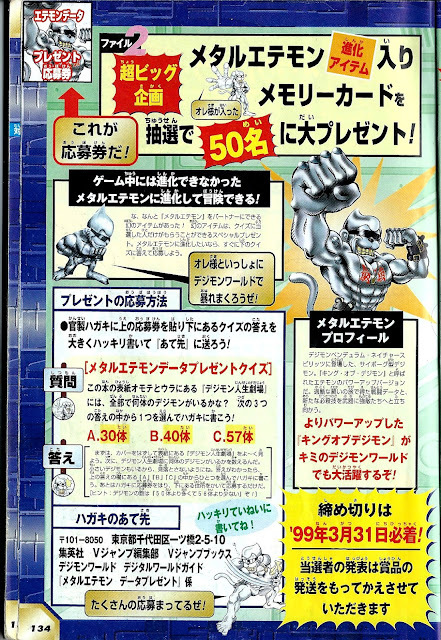 Earlier this year we took apart many of the rumors surrounding Metal Etemon, a Digimon programmed into the game but which can't be obtained without the use of cheat codes. 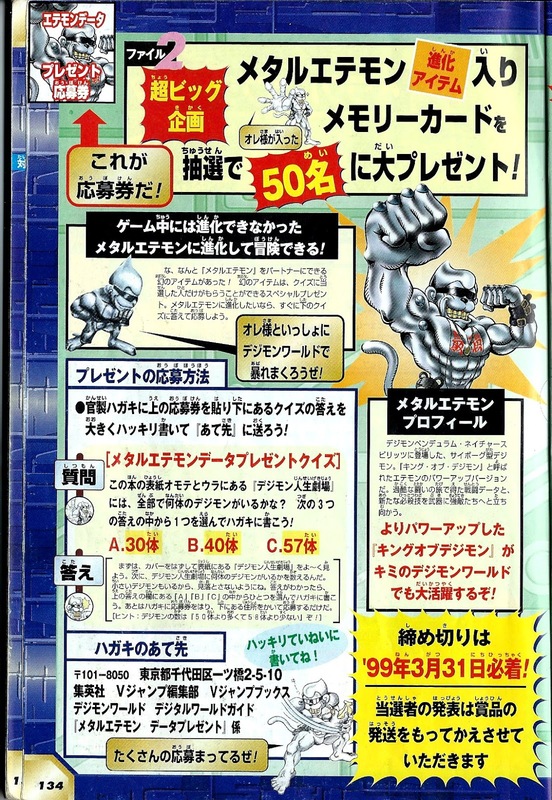 The truth of the matter is that Metal Etemon's evolution item, the Metal Banana, was only obtainable through a giveaway on page 134 of this Digital World Guide, published under Shueisha's V Jump Books imprint. On the surface of book's outside cover binding is a "Digimon Life Theater," how many Digimon are there in all? From among the following 3 answers, choose 1 and write it on your postcard! A cyborg-type Digimon which debuted in Digimon Pendulum Nature Spirits. They are a powered-up version of Metal Etemon called the "King of Digimon." On a journey of rigorous battle, they acquired combat data, new finishing moves, and weapons to face formidable opponents. The powered-up "King of Digimon" appears in your own Digimon World! today for jp is a digimon world first release right? Yes, it's the 17 year anniversary.